Any hostess wants to see her kitchen not only functional, practical and comfortable from the point of view of implementing work processes, but also to have it cozy, beautiful, modern. Undoubtedly, in many respects the design of the kitchen depends on its size, but the ideas we gathered in concerning storage, cooking or consuming food can be used in kitchens of all sizes. The advantage is also that many of the accessories and design techniques can be implemented independently, without the involvement of specialists and serious financial expenses. So, you will review a collection of more than 100+ best original kitchen design odeas with Photos for organizing a practical, comfortable and aesthetic interior of the kitchen space. In small kitchens each square centimeter worth their weight in gold, so you have to use all available space, for example – the height of the room. The location of the upper tier of kitchen cabinets starting from the very ceiling, allows you to increase the number of storage systems. This method is good for kitchen facilities in standard apartments with low ceilings. 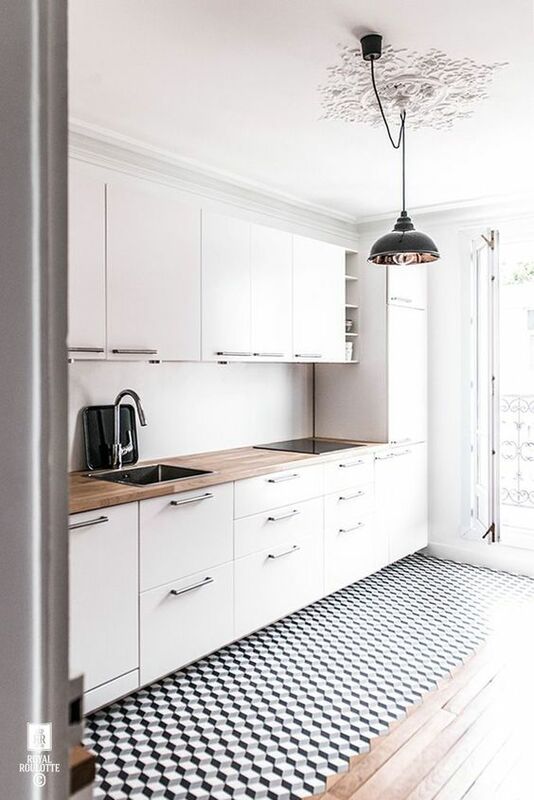 If to the embedding of the kitchen set from the ceiling and to the floor we add white facades, then not only the number of storage systems can be brought to an optimal number, but you can achieve a visual increase in space. If you have a spacious kitchen, then you will have no problems with the arrangement of a dining area for the whole family there – you can install a large table. But what if the area of ​​the kitchen can be called nothing but modest? There are many options, but everything depends on the number of household members, their age (for small children and elderly people it will be uncomfortable to sit at a bar counter, for example) and lifestyle (how often all members of the family gather for a meal). One of the options for organizing a place to eat food is to extend the countertop of the kitchen island. Therefore, the number of storage systems, cutting surfaces or built-in appliances can be increased, and the dining area should be left within the kitchen space (do not take the table segment into the living room). Space you can use the model of a folding table, with the shape of a semicircle for the organization of the dining area in the kitchen space with a deficit of useful. There are models that can be fully reclining and draw upon on one leg, as well as tables having the lowering part, leaving a nearly rectangular table-top for use. A round portable table is an excellent option for arranging a place for meals in a small kitchen. Storage systems can’t be too much, especially if it’s about a kitchen premise – any homeowner will agree with this statement. But it’s not enough to have only kitchen cabinets, it’s important to organize storage in such a way that you spend as little time as possible on finding the right object, store dangerous cutlery and various kitchen accessories in the safest way. Modern furniture manufacturers often offer us a ready-made storage solution – kitchen cabinets with built-in distributors, dividers, rotating shelves, pull-out organizers and other accessories to help keep the kitchen space in order. But there are many solutions that are already used in the finished furniture ensemble or even beyond it. Household items and foodstuffs that need to be used on a daily basis (spices, oils, sauces and other additives) are best kept on open shelves. Then the whole assortment will be in front of your eyes (you can quickly find the right ingredient), and we eliminate the need to constantly clap the doors of kitchen cabinets. If your jars and bottles are not transparent, then the easiest way is to use stickers-labels on which you can sign the name of seasoning or sauce. This method applies transparent dishes as well – many products look very similar (it will be offensively to mix up salt and sugar and spoil the dish, for example). Square and rectangular containers take up less space, both on open shelves and in drawers. To store bottles, you can use the following options for stands and shelves. The advantage of hinged wooden shelves is that not only the bottles are in a reliable container, but there is also a place for glasses. Metal holders can be fastened anywhere – even on the side walls of hinged cabinets. Saving the useful space of the kitchen is obvious. And how do you like the approach to organizing a place for creating notes, writing recipes and moreover creating a mini home office in the kitchen space? It took only the side wall of the cupboard and a small tray (or tray) for office supplies. Another option for using a black magnetic board to organize a place for notes, recipe records and a list of products is the inside of the door of any hanging cupboard. 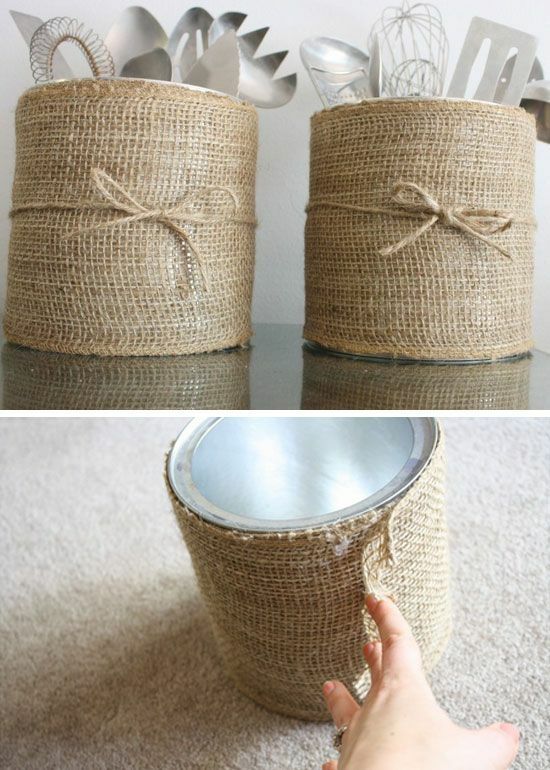 Conventional tin cans (from baby food or large canned food) become creative stands for cutlery, just wrap them with burlap. It is noteworthy that such decorative elements will look organically not only in different variations of the country style (Scandinavian, Provence, Mediterranean), but also in the kitchen space, decorated in modern stylistics. You can also use organizers in the form of wooden trays, containers or boxes with low beads. The convenience of using such supports is that a whole range of necessary household items is at hand, in the right place at the moment. For products that are not desirable to store in the refrigerator (onions, garlic, potatoes, tomatoes, cucumbers, etc. ), you can use special boxes with perforations. 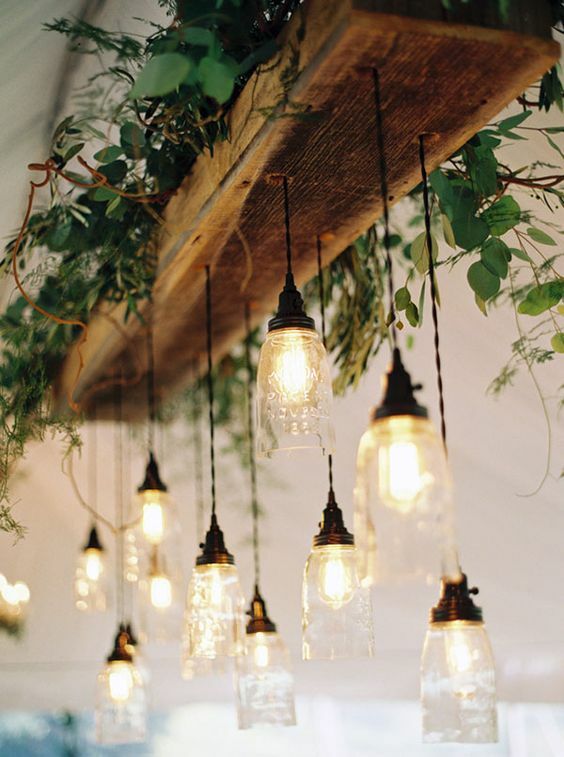 They can be made of plastic, metal, woven from a vine or rattan. 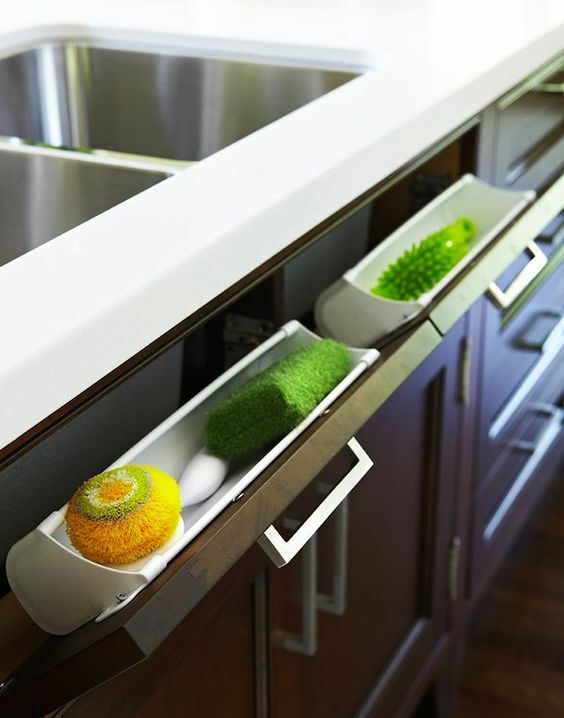 A few ideas on how you can store various cleaning products and appliances for washing dishes and caring over kitchen surfaces that you would not want to display for public. And to store a set of knives and other metal kitchen accessories perfectly fit magnetic strips. They can be attached directly to walls or inside storage systems. But also you should be careful not to harm yourself when the item can slide down the magnet. So it is strongly recommended not to overload the stripe with too much of knives. Almost any item of kitchen use can become a decorative element. For example, the original old-fashioned mixer in brass or copper, golden or white-ceramic version is able not only to fulfill its functions of supplying water, but also to decorate the interior, introduce originality or support the overall concept of decorating the kitchen. Combination of various finishing materials can become a decorative element. 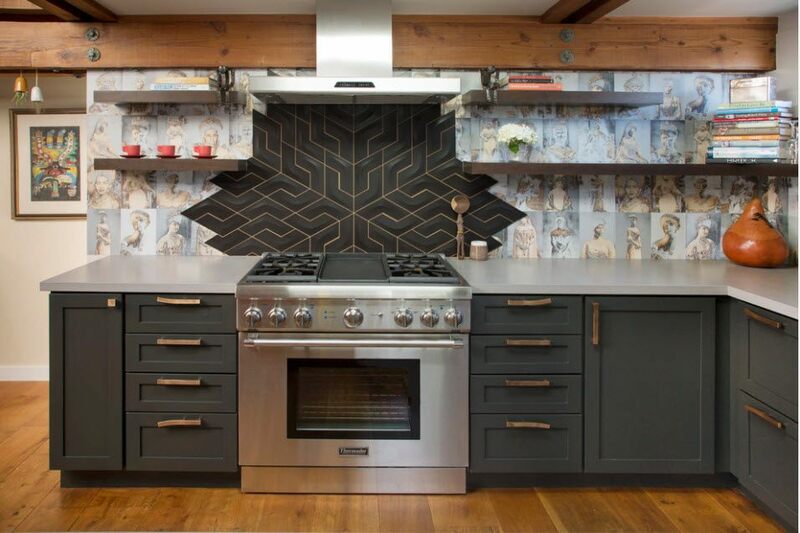 And it’s not just about the original or bright design of the kitchen splashback. For example, you can combine ceramic floor tiles with laminate or parquet in the working and dining areas of the kitchen space. You can also make a porcelain stoneware segment at the entrance to the backyard (a variant of the kitchens for private houses). 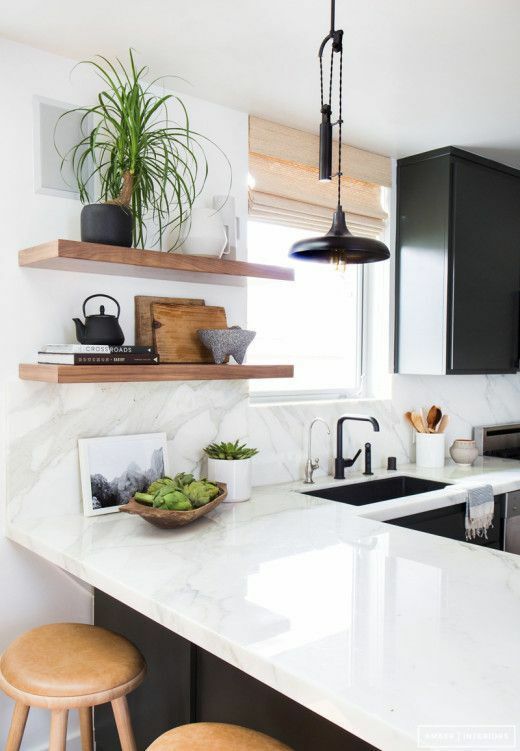 Shelves and countertops of wood, which looks as if untreated (in fact, it is impregnated with special antiseptics and covered with moisture-repellent varnishes) not only bring natural warmth into the modern kitchen design, but also perform many other functions. A socket-tee folds out right from the table top. When its use is necessary? Nothing is impossible. Only an obvious space saving and ease of use should be planned in advance, at the stage of ordering a kitchen set and countertops to it. But it is apparent, that such an outlet is needed for temporary used things: food processors, blenders, mixers etc. Another convenient device is a hole in the countertop for garbage. It is not difficult to get rid of the waste of cooking – just discard all the unnecessary in the hole at the countertop under which the trash can is located. Virtually any element becomes decorative, if it is highlighted. The use of spotlights or LED strip lighting allows not only to create the right level of illumination of the kitchen, but also to create a special cozy atmosphere of the room.. 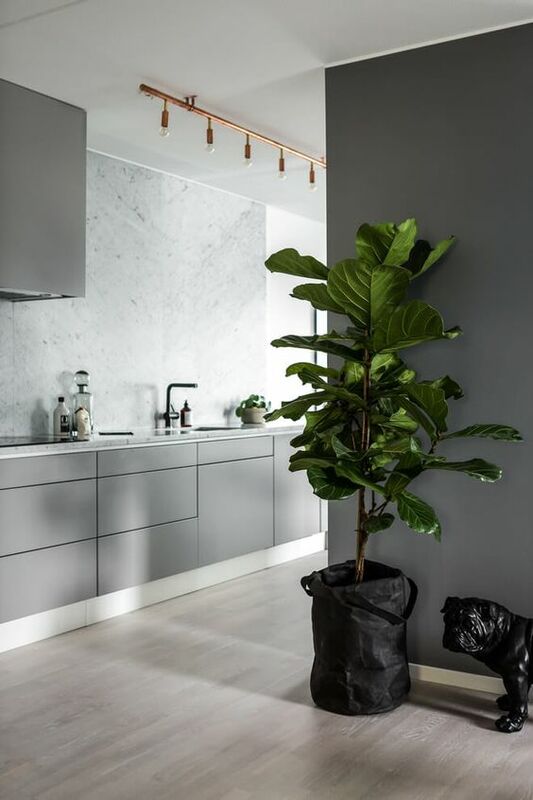 Nothing adds a whiff of nature, freshness and spring-summer mood even on the frostiest day better than the bright greenery of living plants in the interior. 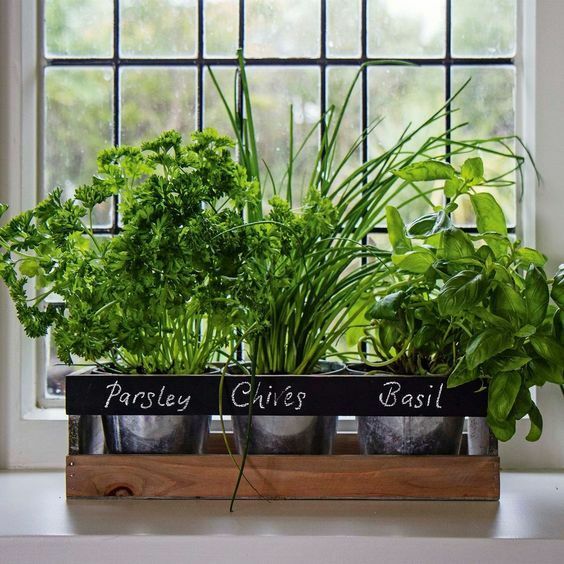 And if these plants not only add beauty and freshness to the design of the kitchen, but can also be used to make delicious and healthy dishes, they deserve the most original design. The usual flower pots on the windowsill have long ceased to be surprise, and often this surface is converted into a functional countertop. How to organize the placement of indoor plants and growing green for a family table and do it decoratively, adorning the kitchen space? 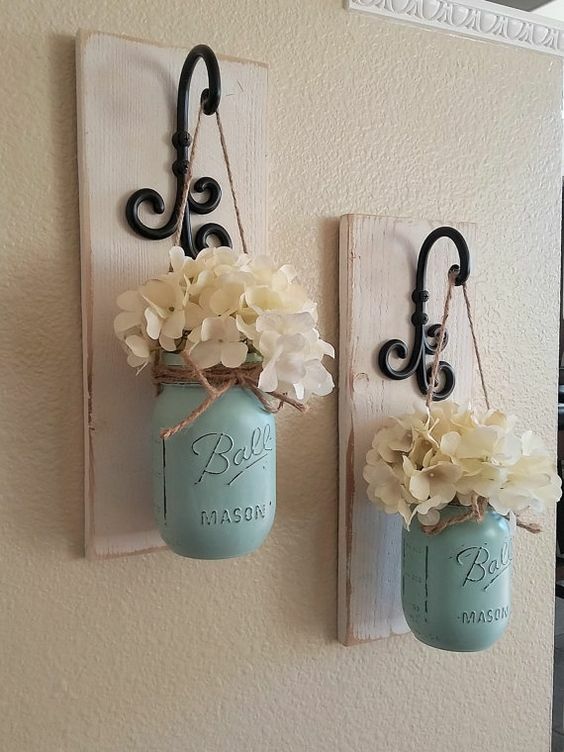 How about hanging pots or containers of ceramics, plastic, glass and even metal on special holders that are attached to the wall? As a result, a whole green wall may appear in your kitchen, and greens for delicious and healthy dishes will all be at hand. If there is no pet that loves climbing curtain rods in your home, this way of placing pots with indoor plants can become a highlight of the interior. Ideal option for sun-loving plants. If the area of ​​the kitchen allows, you can use really large plants in floor pots or tubs. Even the most rigorous, modern interior design “softens” from the presence of such an abundance of greenery.